I've mentioned briefly on this blog previously that I underwent a bit of a detox for around 10 days. During this detox I didn't consume any dairy products, added sugar, gluten or caffeine. I was really surprised that I wasn't craving bread, pasta or a good cup of coffee during this time. I know that cutting out certain food groups isn't always a good idea, but every so often I like to go Gluten free for a while. I find bread very addictive, but if I stay off it I don't miss it, become less bloated, and make the effort to eat a more varied diet with more fruit, vegetables, beans and pulses, as well as drinking a lot more water. Following my detox, Schwartz contacted me to see if I would be interested in taking a 7 day gluten free challenge, and whereas I might have had reservations about being able to do it a few months ago, I knew now that it was easily feasible. 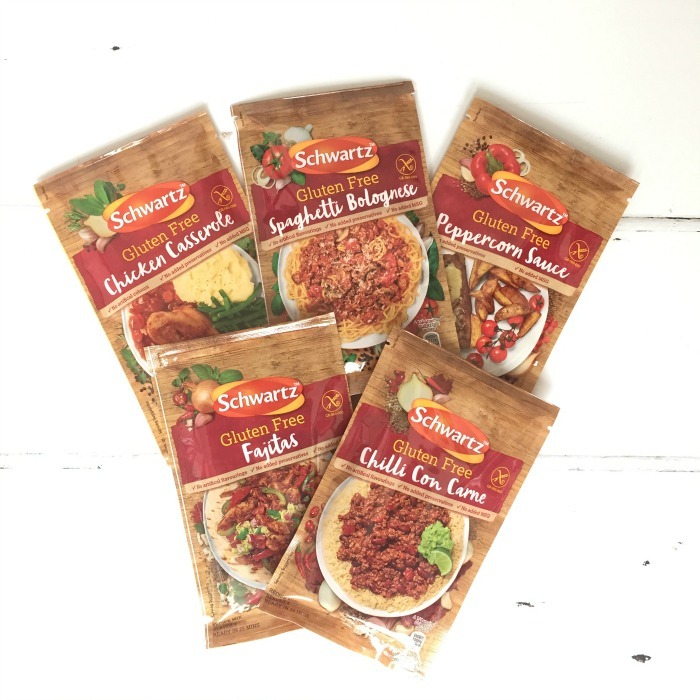 Schwartz, who are one of the largest producers of dried herbs, spices and seasonings, now have a range of gluten free spice packet mixes and sauces. Even if you're following a gluten free diet, whether by choice or out of necessity, you can still conveniently include spices and flavourings into your diet. Chicken Casserole with onions, carrots, peppers and tomatoes, served with a broccoli mash. I cooked up a double batch of chilli con carne and used half to fill baked potato skins, which I topped with the scooped out potato mashed with cheese & herbs. served with salad & sweetcorn. We had the remaining chilli con carne, and added some extra beans and tomatoes. I served this with rice for the rest of the family, and I had cauliflower rice with garlic & herbs. I used a spaghetti bolognese mix on this day to make a tomato and pepper sauce, in which I cooked some gluten free beef meatballs, served with chips and sweetcorn. This was perhaps my favourite meal of the challenge. I used the Schwartz Fajita mix, and instead of using it to make fajitas, I added it to pork mince, which I then piled into pepper halves, and baked them topped with sour cream and grated cheese. The fajita mix had a kind of Moroccan flavour, with the warming taste of cinnamon coming through. This was a very quick and easy dinner of boiled gammon, which I sliced up and served with mashed potato, peas and a cheese and onion sauce, made using the cheese sauce mix and pre cooked red onions and fresh parsley. Our final day was delayed by a day as we were busy enjoying ourselves at the village music festival, but it was worth waiting for. Myself and the husband enjoyed delicious pork steaks topped with gluten free peppercorn sauce, potatoes and roasted vegetables. The week was a great success, with myself, the husband and children all enjoying the meals. The mixes are a great addition to the Schwartz range, and whether you are cutting out gluten due to coeliac disease or as a lifestyle choice, it's now possible to make these dishes safe in the knowledge that they're completely gluten free, but still enjoy the convenience that packet mixes give. Go to this page if you would like to know more about perfect keto.